Even though you died secretly in prison. On the twenty-seventh Matrona died in prison. 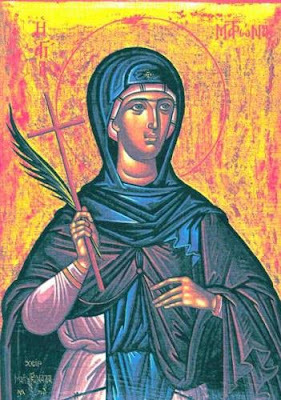 ﻿﻿﻿The Holy Martyr Matrona of Thessaloniki suffered in the early centuries of Christianity, when Christianity was a persecuted faith. She was a maidservant of the Jewish woman Pantilla (or Pautilla), wife of one of the military commanders of Thessaloniki. Pantilla constantly mocked her sservant for her faith in Christ, and tried to convert her to Judaism. Matrona, who believed in Christ from her youth, still prayed to the Savior Christ. When her mistress would go to the synagogue of the Jews, Matrona would not enter but she secretly sneaked away to the Christian church to worship there. One day Pantilla, learning that Matrona had been to church, asked, "Why won't you come to our synagogue, instead of attending the Christian church?" Matrona boldly answered, "Because God is present in the Christian church, but He has departed from the Jewish synagogue." Pantilla went into a rage and mercilessly beat Matrona, tied her up, and shut her in a dark prison cell. In the morning, Pantilla discovered that Matrona had been freed of her bonds by an unknown Power. In a rage Pantilla beat the Martyr almost to death, then bound her even more tightly and locked her in the cell. The door was sealed so that no one could help the sufferer. 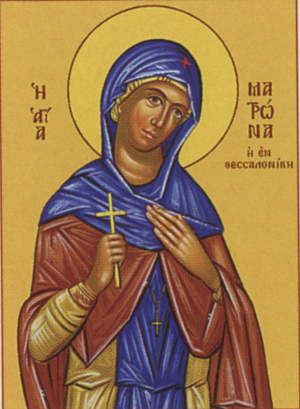 The holy Martyr remained there for four days without food or water, and when Pantilla opened the door, she again found Matrona free of her bonds, unharmed and standing at prayer. Again Pantilla flogged the holy Martyr and left the skin hanging in strips from her body. The fierce woman locked her in the cell again, where Matrona gave up her spirit to God after fourteen days of beatings and starvation. 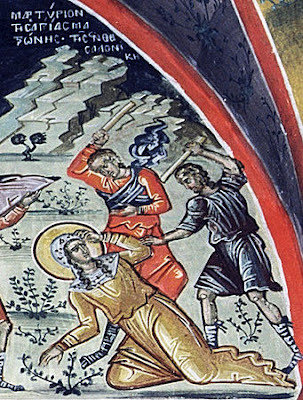 Pantilla had a soldier wrap up her body and the holy Martyr's body was taken and thrown over the walls of the city. Christians took up the much-suffered body of the holy Martyr and buried it along the Via Egnatia. Later, when the persecutions against the Christians had ended, Bishop Alexander of Thessaloniki built a church dedicated to the holy Martyr over the spot she was buried. Her holy relics, glorified by many miracles, were placed in this church. The judgment of God soon overtook the wicked Pantilla. Standing by a retaining wall, she fell into a vat where, after grapes are pressed and trodden, new wine is collected. Her body was smashed, and so she received her just reward for her sin. According to archaeological evidence and various written sources, the Monastery of Saint Matrona is one of the first three monasteries of Thessaloniki. According to the information historians have, until the beginning of iconoclasm (726), there is reference to a "Monastery of Saint Matrona, located outside the walls of Thesssaloniki, with strong fortification. It existed about the end of the 6th and the beginning of the 7th century." It is not known if this monastery was an expansion of the original church dedicated to Saint Matrona. The book of the Miracles of Saint Demetrios (Miracle 13) mentions a church dedicated to Saint Matrona. There it says that during the reign of Emperor Maurice, at around 597, Sclaveni, an Arabic tribe, attacked the monastery because it was fortified like Thessaloniki, and they thought they were attacking the city itself. We have testimony that in 618 there was another siege against Thessaloniki, and all the churches outside the city walls were ordered to be burned. This included the Monastery of Saint Matrona, but it was later rebuilt. In the account of the Saint's deeds we read: "Άθλησις της Αγίας Μάρτυρος Ματρώνης εκ πόλεως Θεσσαλονίκης. Αυτή θεράπαινα υπήρξε Παντίλλης τινός Ιουδαίας, γυναικός στρατοπεδάρχου εν τη Θεσσαλονικέων πόλει," which translates to: "Contest of the Holy Martyr Matrona of Thessaloniki. She was a maidservant of a Jewess named Pantilla, the wife of a military commander in the city of the Thessalonians." 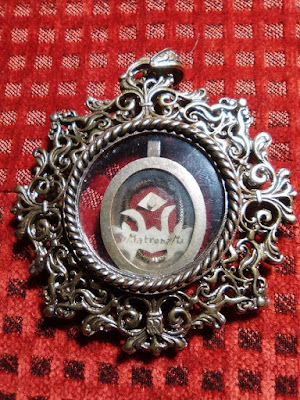 As for the relics of Saint Matrona, they were taken to a church in Barcelona during the Frankish occupation, which was eventually destroyed and burned during the Spanish Civil War by the communists. She is still venerated as a patron of Barcelona. 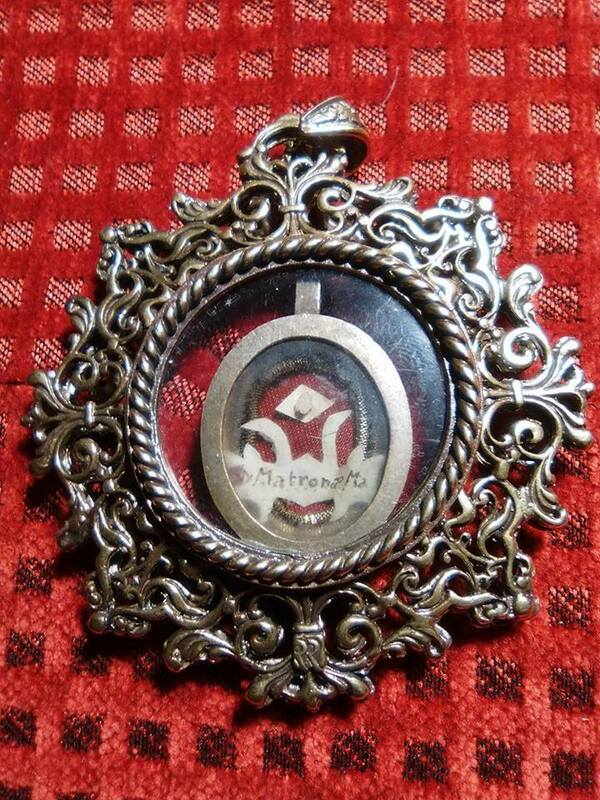 There a tradition rose that Saint Matrona was from Rome and was killed for helping needy Christians. There are possibly only two relics of Saint Matrona left, one in her Catholic parish in Barcelona and one in Saint Andrew's Orthodox Church in Alicante, Spain (pictured above). With undaunted spirit you preserved the Faith, and your soul, Matrona, was not enslaved by the cruelty of your torturers. You excelled in contest, slaying the crafty one and were mystically wedded to the Lord of creation. Fervently entreat him to deliver us from all harm. Filled with the light of the Spirit, O Matrona, you regarded your prison cell as a bridal chamber; and from it you hastened to your radiant dwelling in the heavens, crying out: "In divine love for You, O Word, I gladly endured scourgings."